I can finally say that and mean it! I haven't been so happy about a political event since my childhood. Since the Kennedys, in fact. I stayed up all night here in Switzerland listening to Air America (commentator Ron Reagan!) and checking many sites. Like Jesse Jackson I'm crying with joy and can hardly write, so I've posted Arianna's great piece. It is indeed time for a new Anerican breakthrough. God bless and protect President-elect Obama. "Why All Americans Have Reason to Celebrate"
Even if your candidate didn't win tonight, you have reason to celebrate. We all do. Barack Obama's impressive victory says a lot about America, and also about the current mindset of the American voter. Because tonight voters decided that they didn't want to look back. They wanted to step into the future -- as if a country exhausted by the last seven-plus years wanted to recapture its youth. The history of America is studded with great breakthroughs -- propelled by leaders such as Lincoln, Teddy Roosevelt, FDR, and Martin Luther King - followed by decades of consolidation and occasional regression. The Bush years have clearly been in a period of regression. The repudiation of those years is now almost universal. Even conservatives are admitting it; over the course of today, I've received numerous emails from conservatives ending with some variation on "Go Obama!" In America's journey toward a more just and truly democratic society, tonight is another milestone. And not just because the son of a Kenyan father and a mother from Kansas is now President-Elect. But also because tonight's outcome is a declaration that we are once again a nation more driven by hope and promise than a nation driven by fear. Bush's re-election in 2004 was a monument to the power of fear. And McCain, his staff stocked with Karl Rove disciples, followed the Bush blueprint and played the fear card again and again. Be afraid of Obama, the GOP warned us. Be afraid of something new, something different. He would meet with our enemies. His middle name is Hussein. He "pals around with terrorists," consorts with the radicals at Acorn (which is "destroying the fabric of democracy"), and doesn't see America "like you and I see America." A vote for Obama would be "dangerous" and "too risky for America." The people of America listened, but chose to take the risk. So even if you voted for John McCain; even if you love Sarah Palin, who is still in search of the "pro-American areas of this great nation"; even if are Joe the Plumber - or, hell, even if you are Michele Bachmann - tonight is a night to be proud of America. Obama's victory holds up a mirror, reflecting the country we are. And it turns out to be the kind of country we've always imagined ourselves being -- even if in the last seven-plus years we fell horribly short: a young country, an optimistic country, a forward-looking country, a country not afraid to take risks or to dream big. Of course, it will take more than big dreams to help America dig out from the many crises we face. From the global economic crisis to the wars in Iraq and Afghanistan, the day of reckoning is upon us. But these challenging times also will provide the new president with the opportunity to really transform America. As Gary Hart points out, "Great presidents do not emerge from quiet times; they arise in times of chaos and crisis." We began this journey in the depths of winter nearly two years ago, on the steps of the Old State Capitol in Springfield, Illinois. Back then, we didn't have much money or many endorsements. We weren't given much of a chance by the polls or the pundits, and we knew how steep our climb would be. But I also knew this. I knew that the size of our challenges had outgrown the smallness of our politics. Since that time, the size of our challenges has grown even bigger -- and the smallness of our politics has even downsized McCain from a noble hero to a hack fearmonger. But over the course of this long and arduous campaign, Obama has repeatedly demonstrated the ability to inspire us to tap into the better angels of our nature -- to stir the American people to expect more of themselves than they otherwise would. It's a theme Michelle Obama touched on many times on the campaign trail. "Barack Obama will require that you work," she said at a rally on the eve of Super Tuesday. "He is going to demand that you shed your cynicism; that you put down your divisions; that you come out of your isolation; that you move out of your comfort zones; that you push yourself to be better; and that you engage." This call echoed something that historian and presidential biographer David McCullough had once said about JFK. "The great thing about Kennedy," he told me, "is that he didn't say I'm going to make it easier for you. He said it's going to be harder. And he wasn't pandering to the less noble side of human nature. He was calling on us to give our best." And when Bobby Kennedy was agonizing over whether or not to run in 1968, he told one of his advisors: "People are selfish. But they can also be compassionate and generous, and they care about the country. But not when they feel threatened. That's why this is such a crucial time. We can go in either direction. But if we don't make a choice soon, it will be too late to turn things around. I think people are willing to make the right choice. But they need leadership. They're hungry for leadership." Forty years later, we are starving for it. Real leadership. Leadership geared to transforming the country. Tonight is a night to celebrate the victory of a candidate who seized his moment in history and reminded America of its youth and the optimism it longs to recapture. Let's savor it. The dark years of the Bush regression are almost done. It's time for another American breakthrough. 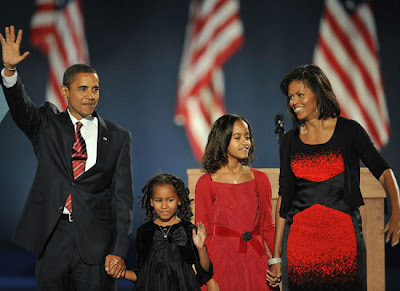 Read more reaction to Barack Obama's victory in the 2008 presidential election from HuffPost bloggers.